We startd our OLinuXino with RT5350F back in July right before our Summer vacation. As soon as I blogged about it we got tons of useful tips and advices on the blog and by e-mails, like info about RT5350F frequency tunning, Antenna design, Overheating internals, which was not obvious from the skinny info on the web. Our first intention was to make this board with 64MB of RAM and 8MB of Flash, but after reading more carefully the datasheet we found that this will require two RAM memory banks and two chips, which would increase the size of the board, so we decided to keep the size and make only 32MB RAM, but to increase the Serial Flash to 16MB. The schematics and CAD files are on GitHub. Note these are preliminary and we have to update them with the latest components exchanges like SPI memory now is W25Q128FVSSIG and RAM is W9825G6JH-6. Although we got tip for the tendency RT5350F to overheat (it uses internal LDO for 1.2V which dissipates enormous amount of heat and can cause the chip to desolder from the high temperature, we are non-believers and wanted to try ourself… well the result is that RT5350F really overheats 🙂 as this 1.2V could be feed from outside too, this will be solved in the next revision and we will put small external DCDC to release RT5350F from this heat source inside the chip. 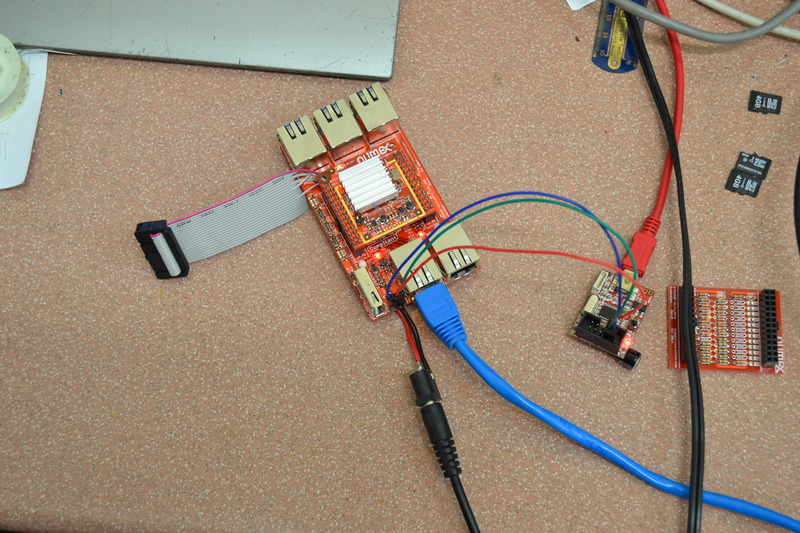 the cable on the left side is JTAG for initial uboot programming to the SPI Flash, the small board on the right side is the USB-Serial for the console. The OpenWRT is running fine, so after all tests are done next week we will experiment to lower the heating and make new prototypes. What we still didn’t decided yet is what EVB to make for this board? Definitely with these problems of the overheating the board will have no problem to run on negative temperatures, just the problem will be if the ambient temperature rise above 40-50C 🙂 but let’s see what will happen with external DCDC in the next revision. 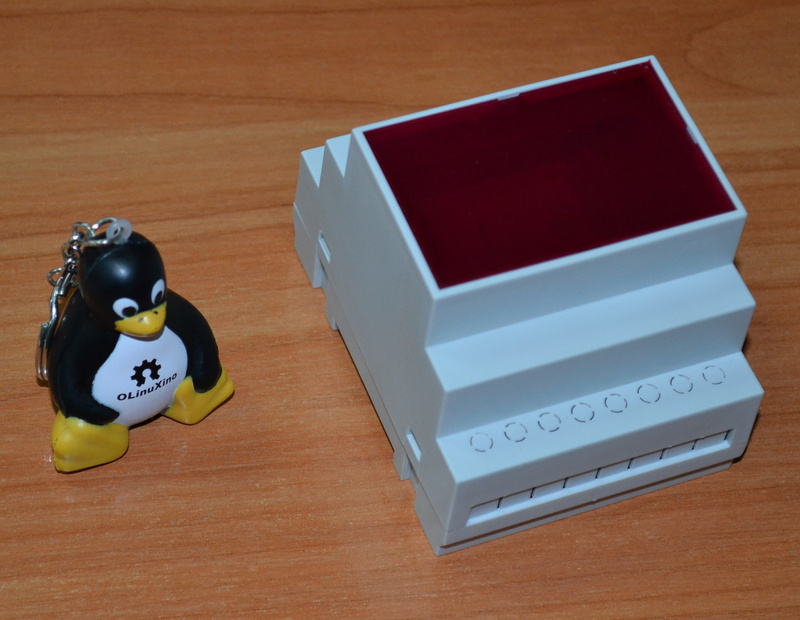 Previous OLinuXino now can be produced in Industrial grade -45+85C Next Radxa Rock Pro/Lite Is OSHW Now! Minimum 2 Ethernet ports with ability to connect maybe one more(so we can use it to route some Wthernet traffic)! looks great and looking forward to receiving it!! Power over Ethernet support would be great, removing the need for the additional power supply. Want! What are the prices? USB OTG should be doable, so that the device appears as a CDC ethernet device when plugged into a computer. You need to put some GPIO pin high in order for the RT5350F to show the OTG. You need to define this pin in the DTS file. You can then make another version – the full featured EVB board that comes with DIN enclosure, relays, IO, ADC, maybe a more robust SMA connector and etc. That 5-ethernet-port thing — are you planning on selling a device like that? I’d be very interested in such a device, to use as a router. I currently use a PC Engine ALIX 2D.13 with 3 ethernet ports, but that’s not enough. Soekris offers a 4-port device but it costs 3x as much. Mikrotik makes a number of embedded devices but they sell their own Router OS, and in my experience don’t care much for people who want to run e.g. Debian (but my last experience with them was years ago). You are going to put 4 x 7 digit segment display ? For these dimensions you can put 1×8 or even 2×8 matrix character LCD w/ or w/o backlight. The price would be the same or very close depending on the w/ or w/o backlight and of course what quantity you purchase from your supplier. But I’m sure the price for 1000+ of 1×8 matrix char lcd w/ backlight is lower or the same as 4 x 7 digit segment displays. In BG the rough prices for 2×8 lcd matrix char is 4EUR at 100 pieces and for 4×7 seg digit is 3EUR at 100 pieces. It will be crazy to put 4×7 seg instead of 1 | 2 x 8 matrix char LCD. Can you route MCS1 on a exposed pad? Maybe some crazy-hobbist would put second chip soldered over installed ram and wire the mcs1 to cs of second ram chip. far5893 idea sounds good.. can’t you just stack two 32mb modules to let us have a 64Mb board? Personally I like the 5350 because it allows for a really small footprint while still having WiFi and USB, which is something you don’t have on your other products. As far as I know other options for this are not open source and/or too power hungry or lack WiFi. Thus, I would favor a minimum size-package which means no display and just one Ethernet (or none), along the lines of Vocore. Are you sure the overheating is coming up from the internal LDO (1.8v to 1.2V @ 500mA). Because It is just a 0.32W loss ? So I did a comparison between the VoCore using internal 1.2V regulator and a Router with RT5350F chip using external 1.2V regulator. See link below for the FLIR images. what is the ambient temperature when you did the measurements? I looked at the latest files on git and they looked unfinished. A lot of errors on several layers. In our company, we are using VoCore for prototypes, but we would like to change to this board. It solves our biggest problems – no external antenna and VoCore is quite hot. Is there some release date? Just saw more details of your VoCore bashing from Juli. A late comment about it. I think this was not fair. They have been extremly open about their progress, mistakes and successes. Let them be happy amateurs but they show true sprit against all odds. Reported daily. Olimex leaves us all in the dark for months about product launches, progress, thoughts, design issues. VoCore has much more of an open source sprit then I see at Olimex (I make a living of opn source). Open source is not just about publishing some files, we all know that even nicely formatted sources without design docs are useless. Olimex does product marketing and publishes some files, makes early promises and then doesn’t deliver in months. The Sitara board layout on github wasn’t even finished when you already listed the board in your store. Also VoCore at least published (suspicious) EMI testing results while you are illegally selling none CE certified products. Some of your designs look quite suspicious from an EMI perspective. Not as much as some sparkfun stuff though. However, open source is also respectful, encouraging, helpful and certainly culturally open minded. Nothing I have seen in your partially rascistic and bashing coments about VoCore. Better don’t throw stones sitting in a glas house. The market is large enough for both of you and there is enough closed source to go against for both of you. No reason to sit on a high horse. If you are in such hurry you can use Vocore’s CAD files and complete your project then you will see if this is OSHW project which you can use to learn, modify, produce and sell. Note that RT5350F-OLinuxino files are also on GitHub before we even start selling this board and you can use them to complete your project, they work for sure as we have working prototypes. You don’t get the point. You can blog when you like and have whatever policies about timelines – your’s are normal, fair enough and fine. I still like the stuff you make. I gave you an encouraging “please hurry up :)” that you may ignore. The point is: you are a global player selling via digikey and mouser. VoCore are two guys who are pioneering in one of the first open source wifi boards ever. They did something you didn’t even think of yourself (instead you are selling illegal propriety wifi hardware). Also fine. I don’t even care about how open you are as we all have to make a living. You are bigger, have much more experience and make better designs. But another point is: you are not more open than VoCore just because you share the final sources. Actually VoCore is more open. Support them instead, help them, welcome them to the community. But you are bashing and make fun of them as if they were your worst enemies and competitors. There is enough open source space for everyone. And if this bad bashing is your sense of fun at work then I just don’t share your style of humor. VoCore sounded like really having fun. if you are so OK with what Vocore did and they are so Open, then you can make your product based on their work and the files they share, then why is this noise complaining how long it takes us to release our product? I agree to your view on Cubietech, Wrtnode and could name 10 more myself. I am myself too slow publishing all designs in a timely manner. There are only so many hours per day for my hobby. I have not been complaining about how long it takes you to publish a board. I just wish it was a available soon giving you feedback about my demand. In my open source day job this type of community feedback is exactly what we want and rather makes my team more motivated, drop everything else since they love to hear that people want it. They have fun in delivering something that gets into people’s hands and is being used. You just get grumpy and upset. If you don’t need community then sorry for disturbing your own fun. You say Vocore designs published as V1.0 are different from their final board V1.0 and do represent a board that works worse or not at all? If that’s true (and I really don’t have the time to verify) then I completely agree to you as well and apologize for everything I said about bashing them. I would like to know the current status of the project. Also, is there a tutorial or the steps to compile the openwrt and uboot for this particular hardware? I would also like to learn about the current status of this product. What will be Olimex’s answer to that? Do you have info from Allwinner about their new R8 SoC?